Rutherford B. Hayes became the 19th president of the United States in one of the most disputed elections in American history. He was a champion of civil service reform, supported hard money policies, and worked to reconcile North and South by ending Reconstruction through withdrawl of Federal troops from the South Carolina and Louisiana statehouses. His dignity and integrity helped revive the prestige of the presidency, which had been shaken by the Johnson impeachment and the corruption and scandal of the Grant administration. Hayes’ most famous quote, "He serves his party best who serves his country best," is from his 1877 Inaugural Address. 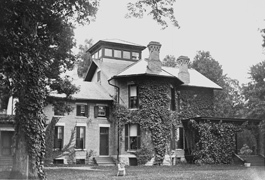 Hayes moved to his Spiegel Grove estate in 1873 and immediately began to enlarge the house to accommodate his large family. When he left office in 1881, he returned to the house, now totaling over 30 rooms, and lived there until his death in 1893. He and his wife lie buried on the grounds. Rutherford B. Hayes’ father died shortly before his birth on October 4, 1822, in Delaware, Ohio. Sardis Birchard, his maternal uncle and a successful businessman, served as guardian and surrogate father to young Rutherford and his sister Fanny Arabella. Hayes graduated from Kenyon College in 1842 and Harvard Law School in 1845. He then took up practicing law in Lower Sandusky. Active in local politics, Hayes headed up the committee that suggested that the community be renamed “Fremont,” after the dashing hero of the West, Colonel John C. Fremont. Hayes’s law practice and political career blossomed after he moved to Cincinnati in December 1849. Opposing the expansion of slavery, he joined the Republican Party in the 1850s and played an increasingly important role in city politics. In 1852, he married Lucy Ware Webb, the first wife of a president to be a college graduate. He soon came to share her deeply religious opposition to slavery. They had seven sons and one daughter. They lived in Cincinnati until the Civil War. Sardis Birchard, who acquired the land for Spiegel Grove c. 1846, built the earliest part of the existing house between 1859 and 1863 as a summer retreat for Hayes and his family. He named the estate Spiegel Grove, because the pools of water that collected after rain reflected the towering trees like mirrors. “Spiegel” is the German word for mirror. The two and one-half-story brick house had an open veranda on three sides. It contained a formal entrance hall, a large parlor, a bedroom, and kitchen quarters on the first floor. Bedrooms and storage space occupied the second story. Manning Force Hayes, the last of the Hayes children, was born at Spiegel Grove on August 1, 1873. Hayes became a major general during the Civil War. He sustained a severe wound at the Battle of South Mountain, near Antietam, Maryland--the only president ever wounded in action during the Civil War. Nominated for a seat in Congress in 1864, Hayes refused to campaign and served with his regiment until the end of the war. He took his seat in the House of Representatives when the session opened in December 1865. As a congressman, Hayes supported a Radical Reconstruction program. Reelected in 1866, Hayes resigned to run for governor of Ohio. The first Ohio governor to serve three terms, 1868 to 1870, 1870 to 1872, and 1876 to 1877, Hayes was a competent leader. In 1873, Hayes returned to live at Spiegel Grove, which remained the family residence until 1965. Recognizing that the house was too small for his family of seven, he commenced plans for the construction of a frame addition to the west side of the original building for a new kitchen, woodhouse, and privy. Hayes used his position as governor to advance his candidacy for the presidential nomination at the Republican Convention of 1876 in Cincinnati. His reputation for integrity, war record, party loyalty, and moderate liberalism made him an acceptable compromise candidate. He ran against Democrat Samuel J. Tilden, governor of New York, in November. One of the most bitterly contested elections in American history kept the nation in turmoil until two days before the inauguration in March. Tilden won the popular vote but lacked one electoral vote for victory. The outcome depended upon contested electoral votes in three southern states: Louisiana, South Carolina, and Florida. Tilden needed to win only one vote; Hayes needed all the disputed votes to win. Congress finally created a special commission to settle the dispute in January 1877. The 15-member commission consisted of five from each house of Congress and five from the Supreme Court, eight Republicans and seven Democrats. The commission voted in favor of Hayes on strict party lines. Hayes took the oath of office privately in the Red Room of the White House on March 3, becoming the first president sworn in at the White House. A second, public swearing in took place later at the Capitol. Controversy followed Hayes into office. During the election dispute, the Republicans in Congress promised southern Democrats railroad subsidies, Federal patronage, at least one Cabinet post, and cessation of support of the Republican governors in South Carolina and Louisiana. Although Hayes may not have been personally involved in this deal, he did withdraw Federal troops from statehouses in South Carolina and Louisiana, effectively ending Reconstruction. He also included an ex-Confederate in his Cabinet, while insisting that he made his appointments based on merit. His actions helped reconcile the North and South, but outraged members of his own party. Hayes also had to deal with labor strife and immigration issues. The first wave of great national strikes occurred during his administration. In the summer of 1877, the country was still suffering from the depression that began during the Grant administration. When the railroads slashed wages for the third time in as many years, strikes and riots ensued. Hayes sympathized with the plight of the workers but sent Federal troops to restore order in certain areas. In 1879, as anti-Chinese agitation increased on the West Coast, he vetoed a popular immigration bill that would have prohibited all Chinese immigration, contending that it violated treaty obligations. He later worked out a modification of the treaty that did restrict immigration. President Hayes was the first president to focus on civil service reform. He succeeded in removing some government jobs from partisan control. In the most famous episode of his crusade, he removed Chester A. Arthur, future president, from the collectorship of customs at New York City. Opposed by many members of his own party, Hayes was unable to create a Civil Service Commission. He signed a bill in February 1879 allowing women attorneys to argue cases before the Supreme Court of the United States. In 1878, Hayes began the annual Easter Egg Roll for children on the White House lawn, a tradition that still takes place on the Monday after Easter. Hayes honored his pledge that he would only serve one term and retired to Spiegel Grove in 1881. He prepared for his retirement by building an addition to the house that more than doubled its size. The addition included a library and drawing room on the first floor, with bedrooms above, and indoor plumbing. It also incorporated a number of interior changes and the construction of a fourth-floor cupola that Mrs. Hayes used as a greenhouse for her plants. A spectacular four-story walnut and butternut staircase added during the renovation leads to a 360-degree view of Spiegel Grove. In 1889, the Hayes commenced on alterations to their home once again, removing the frame addition of 1873 to add a larger addition for a dining room and new kitchen. Mrs. Hayes died before this addition was completed. The 1889 addition was the last major alteration to the house. The parlor on the first floor, known as the Red Room, and Sardis Birchard's bedroom on the second were the only rooms of the original house that remained intact after all the alterations. After his presidency, Hayes remained active with humanitarian causes such as prison reform, education, aid for black schools, veteran’s affairs, and local charities. He travelled frequently for speaking engagements. He wrote extensively on his beliefs on social reform and growing concern about the increasing disparity of economic classes. He died at his beloved Spiegel Grove in 1893. 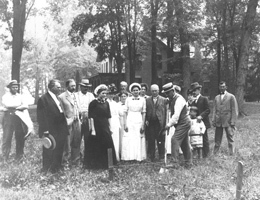 In 1912, the president’s children gave the Spiegel Grove property to the State of Ohio, although the family continued to live in the house until 1965. Today the Hayes Presidential Center manages the property in association with the Ohio Historical Society. 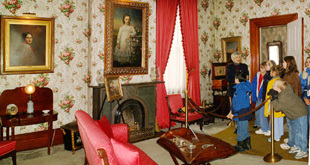 Several family portraits and original furnishings adorn the house. The library in particular contains numerous mementoes including two framed photographs of Lincoln. 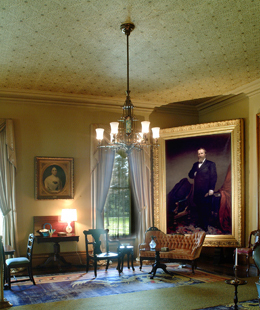 Hayes, an avid reader, designed the room to display portraits of former political greats. The graves of Lucy and Rutherford Hayes are on a small hill at the south end of the estate. The State of Ohio constructed a museum and library building on the grounds of Spiegel Grove in 1916. Two additions date from 1922 and 1969. The research library has approximately 70,000 volumes, including the president's personal library. The exhibits in the museum focus on the life and times of Rutherford B. Hayes, his family, and Ohio history. The first floor is primarily a biographical exhibit; it includes a lovely large breakfront, which displays Hayes’ White House china. A life-size diorama of Hayes in camp during the Civil War illustrates his active participation in that conflict. The Rutherford B. Hayes Presidential Center, Spiegel Grove, located at the corner of Hayes and Buckland Aves., Fremont, OH has been designated a National Historic Landmark. For mapping purposes only the address is Spiegel Grove. Click here for the National Historic Landmark registration file: text and photos. The Rutherford B. Hayes home is also an Ohio Historical Society Site. The Rutherford B. Hayes Presidential Center includes two major buildings – the Hayes Home and Hayes Museum. Daily tours of both are available year-round, Tuesday –Saturday 9:00am to 5:00pm and Sundays and Holidays 12:00pm to 5:00pm. The buildings are closed New Year’s Day, Easter Sunday, Thanksgiving, and Christmas Day. Visitors can opt to tour one building or both. Tours of the Hayes Home are guide led and take 45 minutes. The Hayes Museum is a self-guided tour, with docent-led tours available for groups of 15 or more by prior arrangement. For more information visit, the Rutherford B. Hayes Presidential Center website or call toll free 800-998-7737. The website provides a wealth of information on the place and people of Spiegel Grove.